Shadow of the Colossus director Fumito Ueda is happy that so many people think his game is art, even if he isn't entirely sure why. Shadow of the Colossus is pretty much the poster-child for the "games as art" discussion, and invariably gets wheeled out as an example when someone takes a pop at videogames' artistic merits, such as the comments made by Roger Ebert earlier in the year. Uedo said that he was happy and flattered that people thought of the game in that way, but thought that he could have done more to earn the praise. 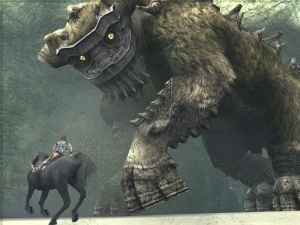 Ueda was humble about the praise for Shadow of the Colossus, and said that in his opinion there were games that are much better examples of art. He said that in Japan, the idea of art was something that was uncommon or unique. Because of this, he was reluctant to actually name any of the titles he considered more artistic, for fear of detracting from their uniqueness. He also expressed curiosity about exactly which part of SotC people considered to be art. He felt that the game could have been more artistic, but that because it was a game, the possibilities for artistic expression had been "subdued." Shadow of the Colossus is being re-released as one half of a Team ICO double bill on the PS3 in spring next year. Team ICO's next game, The Last Guardian is scheduled to be released in late 2011.